Every girl who turns eighteen would love to celebrate this important event like Giulia and Carolina did. 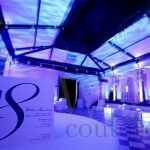 This incredibly chic twin party took place in February in one of the most beautiful venues in Milan, “La Posteria”, which is situated in the very heart of the city and perfect for glam events, bespoke weddings and gala receptions. 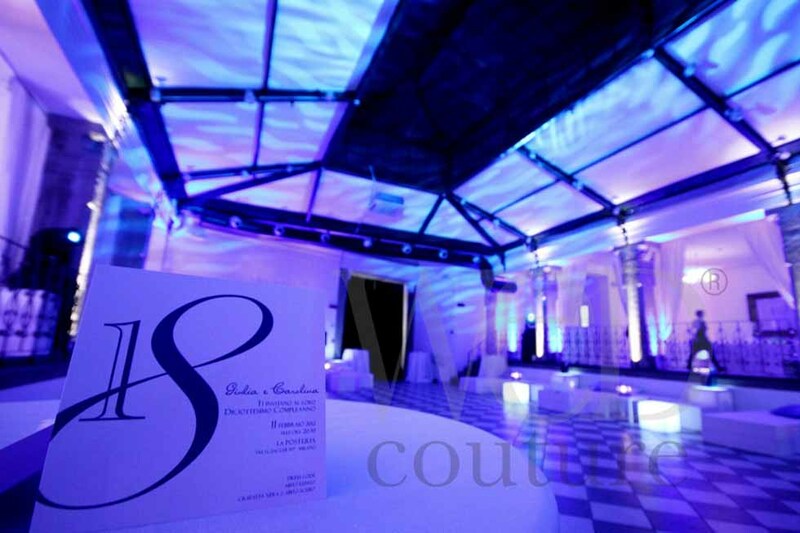 The main theme was blue, the preferred color of one of the twins, and the glamourous style of the venue itself did the rest of the design. Great emphasis was put into the styling of the venue and the lighting design where a mix of warmth from the candles paired with led garlands, illuminated white cubes and and the electric blue light created an intimate, city-chic atmosphere, perfect for this kind of luxury event. A fashion birthday party in Italy requires particular attention to the food and drinks served. Everything had to be top-class, finger foods and sushi were of the highest quality and prepared in a way that truly showed the art, the talent and the craft of the amazing caterer. Of course, nothing less than champagne could accompany this incredible menu Ã¢â‚¬” later on specialty drinks mixed by the skilled barmen were necessities in this exclusive Italian party. Creating a spectacular presentation of the food was crucial and together with the Caterer, I took pride in searching for only the finest solutions: Clear bowls and sleek cones hanging from clear or white plexiglass trees, plexiglass displays, square black and white finger food containers placed on glass trays on top of square glass vases were only some of the solutions we adopted. An 18th birthday party isn’t perfect, though, without music and dancing. Getting a well-known DJ from the nightlife in Milan was the perfect choice for heating up the atmosphere and letting the twins and their guests dance and have fun until morning.